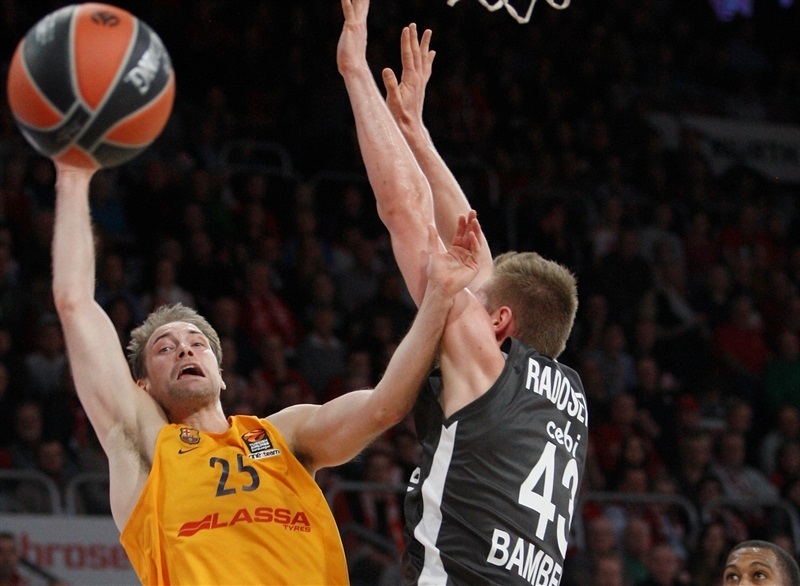 Bamberg soars by 20 over Barcelona! 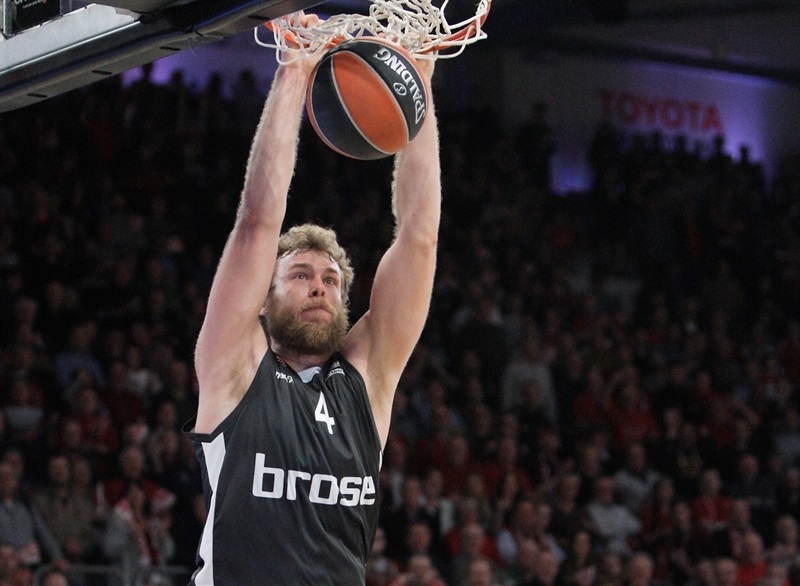 Brose Bamberg continued its climb from the bottom of the standings by holding firm at home for an 85-65 victory on Thursday over visiting FC Barcelona Lassa. 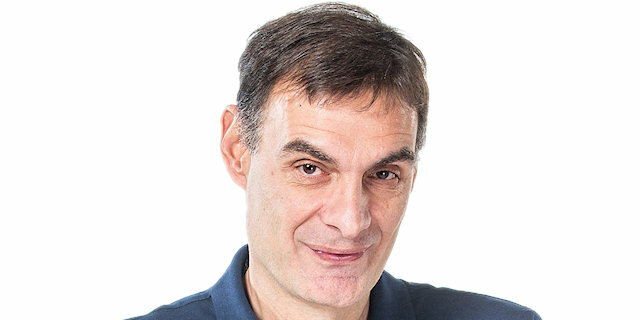 Both teams now have 7-9 records now, just outside the playoff positions, but Bamberg has a tie-break advantage between them because Barcelona won their first game by just 4 points. 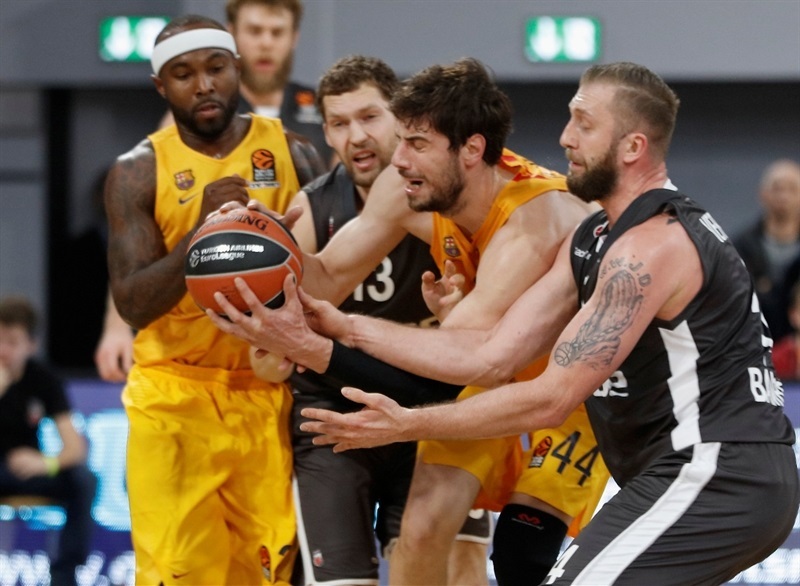 Bamberg's defense was aggressive from the start and forced Barcelona into 18 turnovers, while just four players of the hosts outscored the visitors. Darius Miller hit 6 of 8 three-pointers on his way to 20 points. Janis Strelnieks matched him. Nicolo Melli added 17 plus 13 rebounds, while Daniel Theis scored 11. 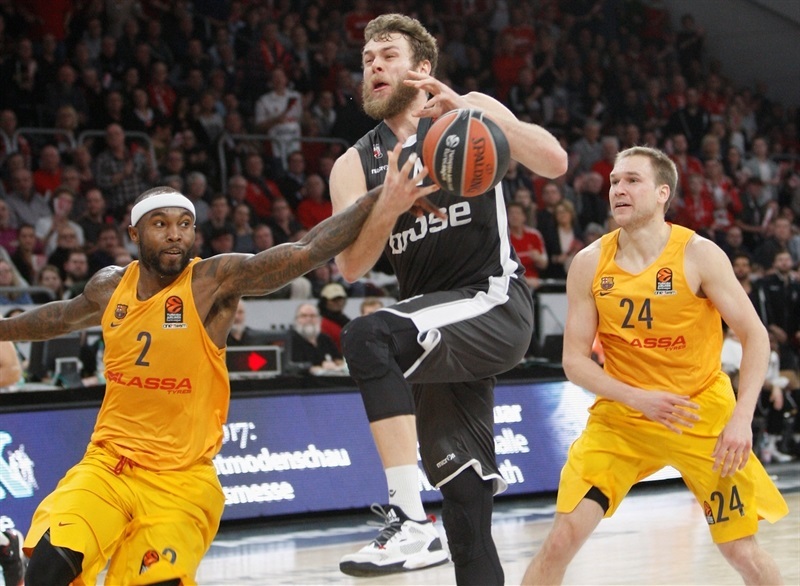 Barcelona got 19 points from Tyrese Rice but no one else escaped single digits, although Aleksandar Vezenkov sparked a 3-18 run over the last two quarters that got the visitors within six points twice, the last time at 66-60 with 5:36 to play. 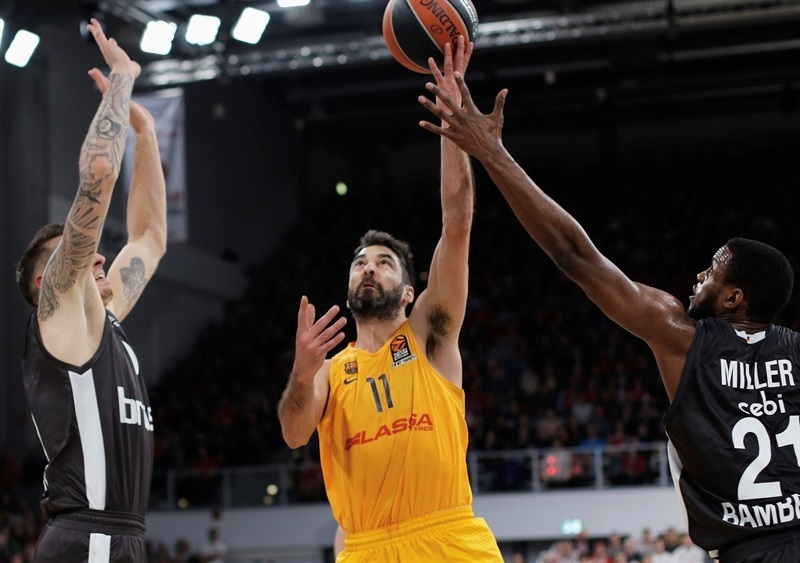 Miller's sixth triple and one he dished for Theis ended that threat and there were no more as Bamberg outscored Barcelona 19-5 the rest of the way. 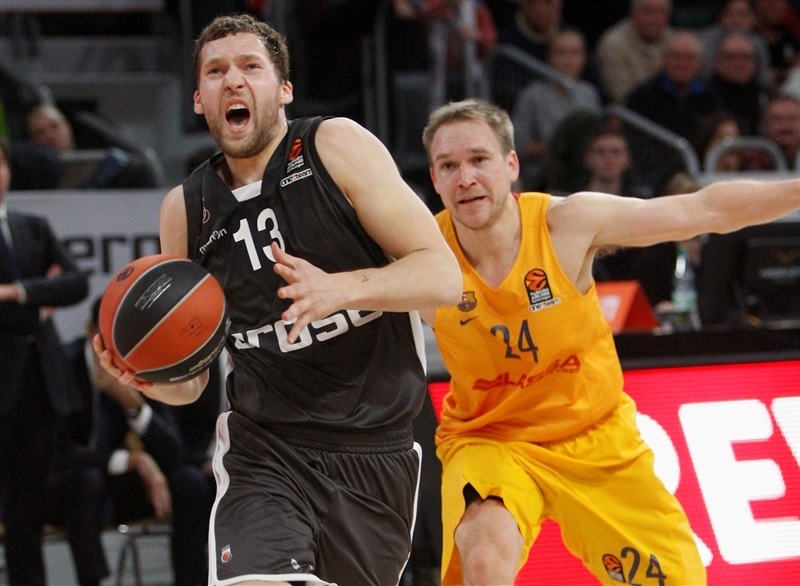 Miller struck from downtown to open the scoring and Melli soon dropped a jumper for a 5-0 Bamberg lead. Juan Carlos Navarro got Barcelona on the board with a back-door layup before Rice struck from deep for a 5-5 tie. Miller broke it with his second triple but Justin Doellman matched him at 8-8. 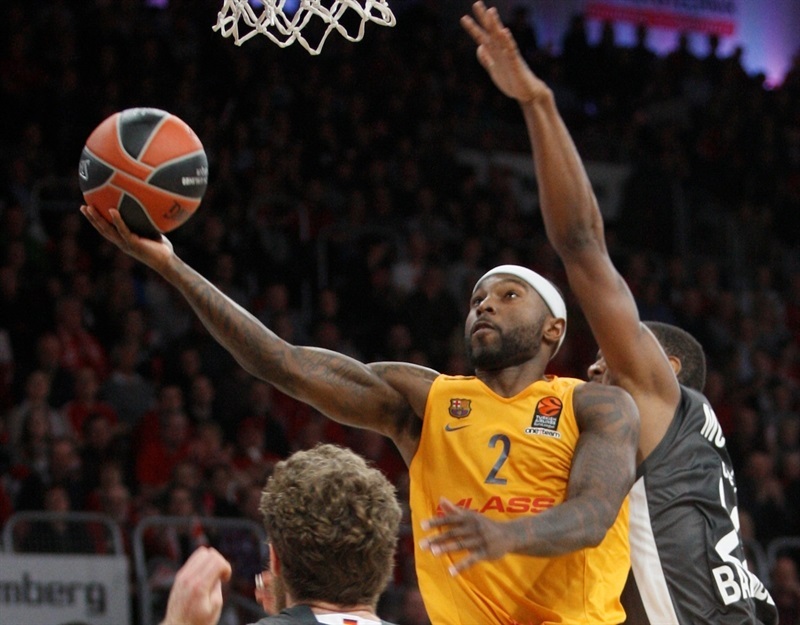 Navarro's step-back triple gave Barcelona its first lead, but Miller landed his third for another tie. Ante Tomic finished inside and Rice buried a long two-pointer as Barcelona went up 11-15. Fabien Causeur and Doellman exchanged short baskets before Strelnieks struck from the corner to end the first quarter 18-17. To start the second, Alex Renfroe said hello with a three-pointer against his former team as Barcelona regained a lead, but Leon Radosevic scored inside for another tie and Strelnieks broke it with yet another triple, 23-20. Petteri Koponen's free throws were answered by a layup from Theis at 25-22. Melli made a steal at one end and a tip-in at the other, then drop-stepped for another basket at 29-22. 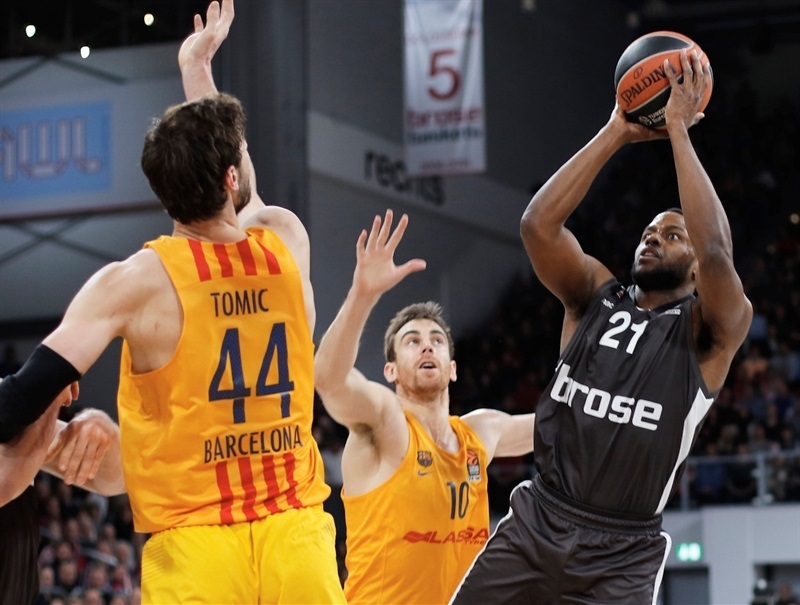 Renfroe stroked from the arc Navarro found Tomic for a dunk to keep Barcelona close, but Radosevic's tip-in and Jerel McNeal's first EuroLeague basket made it 35-27. 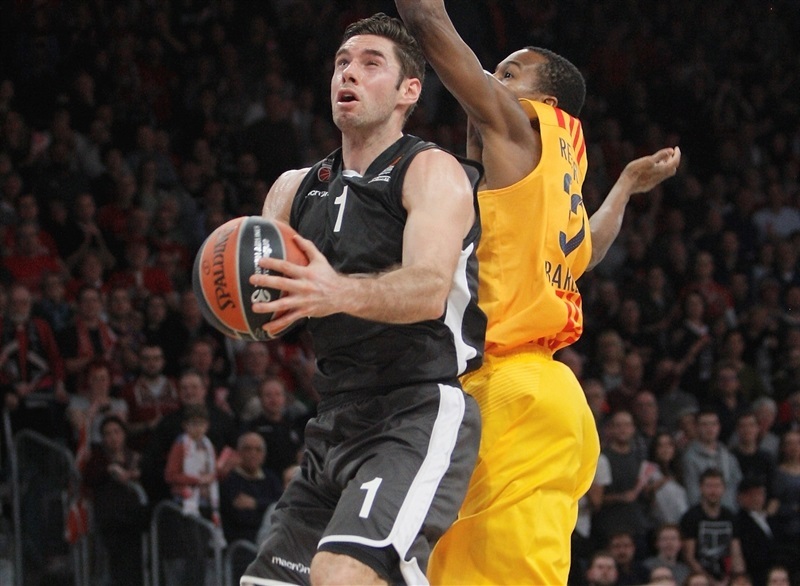 After a Rice layup, Miller measured his fourth triple without a miss as Bamberg surged to a 40-31 halftime lead. Melli powered in a layup and faded away for a jumper at 44-31 to start the second half. Baskets by Tomic and Rice settled Barcelona until Strelnieks poured in a triple and free throws at 49-35. When Melli dropped a long jumper and Causeur a deeper one, the Freak City fans were roaring with their team ahead 54-35. Rice got a basket back that Radosevic answered with an alley-oop slam. Free throws and a triple by Aleksandar Vezenkov cut the difference to 57-43 before he and Melli exchanged inside baskets. Then Rice broke loose with a layup to end the third quarter 59-47. Vezenkov kept it rolling with a layup to open the fourth and Rice added his own to extend Barcelona's run to 3-15 and cut the difference to 59-47. Rice's layup and Brad Oleson's put-back cut the lead further, to 59-53, before Miller answered to calm the hosts. 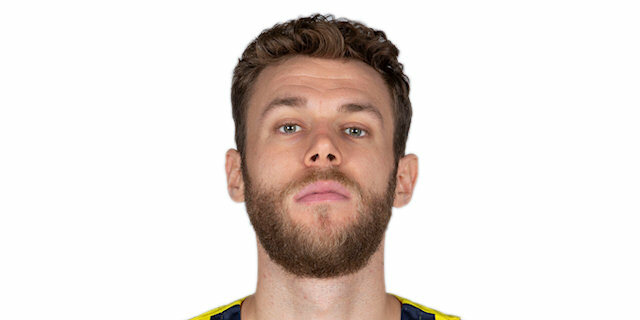 Strelnieks followed with a two-pointer then fed Theis for a slam. Free throws by Tomic and a triple from Oleson made it a six-point game again, 66-60, but Miller was ready with his sixth triple and then dished to Theis for another and suddenly it was 72-60. Another Strelnieks-to-Theis alley-oop and a solo second-chance dunk by the latter got Bamberg in sight of the win. 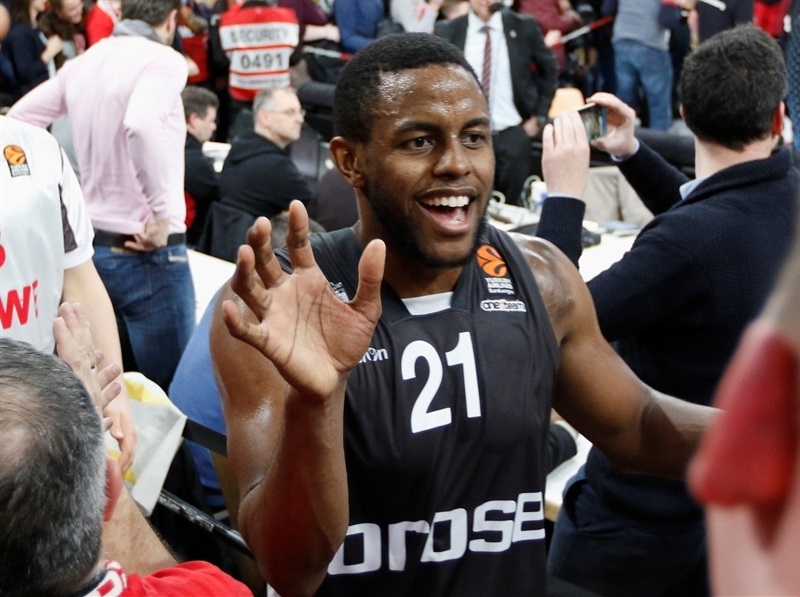 When Koponen and Olson cut the difference to 76-65, Causeur stole and made a layup, then Melli rebounded and slammed going into the final minute at 80-65 as Bamberg rolled to another home victory. "Happy new year to everybody. Wow. Great win. Great atmosphere. Great start of the new year. We played an amazing game on defense. Everybody sacrificed to execute the game plan with great discipline. Then it cost us a little bit of energy. We had, let's say, four or five minutes when we stopped playing. We made some turnovers and it was hard to stop them. But in the worst moment of the game, from up by 20 we were then up by 6, with the momentum for Barcelona, we put together a 10-0 run and we killed the game. Guys, we beat Barcelona by 20. And it's really the best way to say thank you to my players. We never lost the hope that we can play good. We kept working and we didn't do anything special in the big picture, but it was a special night. The whole team played great defense, moved the ball on offense, good spacing, good screens. So, it's a great night." "Good evening and happy new year. It's obvious that we didn't play well. We should have played much, much better if we wanted to win here against a team that is in great shape. They played with great confidence and we needed to play much better at both ends, defensively and offensively. Even when we minimized the difference to 6 points and had the opportunity to go for the win, twice we made some silly defensive mistakes. They scored 2 threes and the game was over. 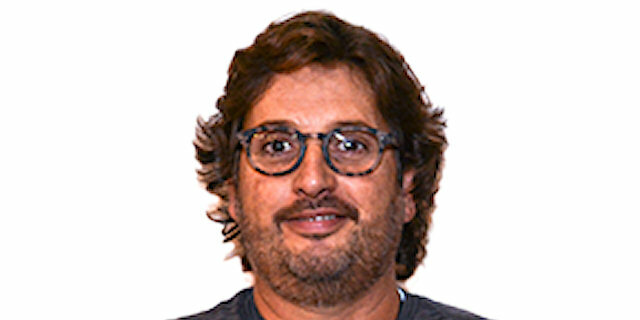 I have to congratulate Andrea and his team for this big win. We have to analyze what we did wrong and for sure we have to fight more. Beyond basketball tactics and all this, we need our fighting spirit to be one step up." "Absolutely a great game, we start well the year. After a win at Galatasaray, we knew if we want to, let’s say, complete our effort, we needed to win this game. We did it, and we did it in a good way, but it is still long ways to go. A lot of games to go. We have to stay focused, keep balance, but we can enjoy tonight because we had an incredible game. Energy was the key, we had time to prepare the game, we had a lot of energy throughout 40 minutes. This was our key."